Crochet gloves were the inspiration for the trim choice for the polka dot top. 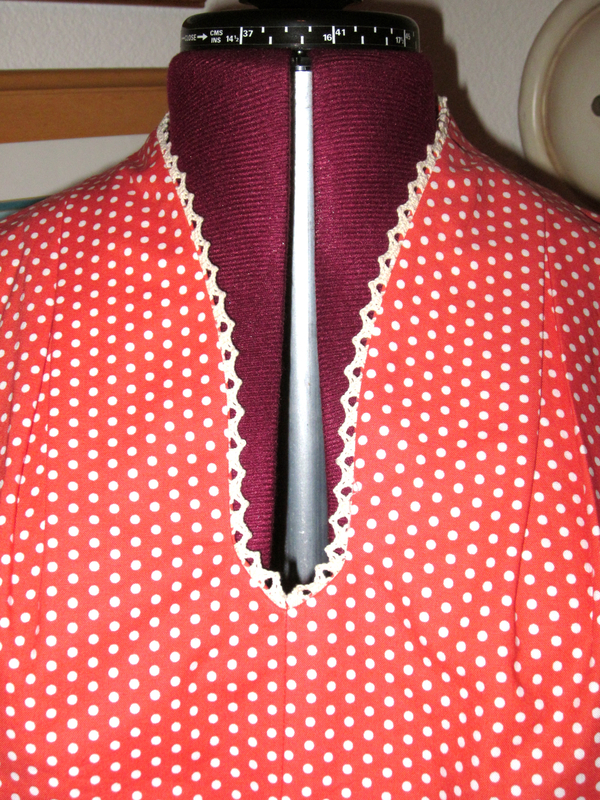 Both the neckline and sleeves have facings, so the construction lent itself to a trim insertion at those edges. Today, I put in the crochet edging at the neckline. I was hoping to use the Clover Wonder Clips to hold the trim in place while I sewed. I thought they would be a perfect choice since pins don’t work all that well with the open lace of crochet. As it turns out, the Wonder Clips have a working depth of 1/2 an inch, and the crochet trim only needed to be inserted into the seam 1/8 of an inch. That didn’t work out too well for my 5/8 inch seam. I’m sure I’ll find a use for the Wonder Clips in garment sewing. I’m going to try them instead of pins for the zipper insertion. Anyway, today was the neck facing. First I sewed the trim to the main fabric piece. Then I pinned the facing to the main piece, but I did it a little differently than I’ve done in the past. Usually, I pin the small facing piece face down on top of the larger main piece. It’s easier to work with this way, but this method puts on the outside the piece that will end up on the inside. This time, I put the facing right side up on my dress form. Then I put the bodice right side down on top and pinned everything together. This was handy for sewing because that put the stitching line for attaching the trim on top where I could see it. This way I could sew exactly on that line to attach the facing. Next will be piecing and attaching the peplum, then putting in another invisible zipper. I’m hoping for a better result with that darn zipper this time. What I learned today: I realized a couple of days ago that since I underlined the top, I probably had no need for interfacing. But I had already fused all the interfacing and facing pieces, so I went forward with my original plan. The faced edges will be thicker than necessary, but I don’t know that there’s any real harm from the extra layer. I will, however, keep that in mind the next time I underline. Your blouse is a huge success. The crochet eding did wonders. Nice touch. Don’t fret about the interfacing. I’ve done the same thing in the past especially when I’m working with a pattern for the first time. What I normally do after I’ve complete a project is to jot down the adjustments on the pattern envelope. These notes come in handy when I work on the pattern again. Thanks, Redbamsews! I briefly considered skipping the edging because I thought it might be a bit much, but it came out better than I expected. I think that’s because such a small bit shows. I really like that neckline and may have to adapt it for another project.